Fit the box spring just fine. Gives that old country look I was going for. I would recommend to others. Muted caviar black* stripes on a pale khaki background give your bed a "pop" without overwhelming the rest of the room. The Kendra Stripe Black* Bed Skirt is made with 100% cotton. The picture is very deceiving. The background color is more of a dark tea stain color. The black ticking stripe is a very washed out color of black. The fabric is very thin. There is almost no ruffling affect at all. It does fit the bed very well. I washed it before using and there was no shrinkage. 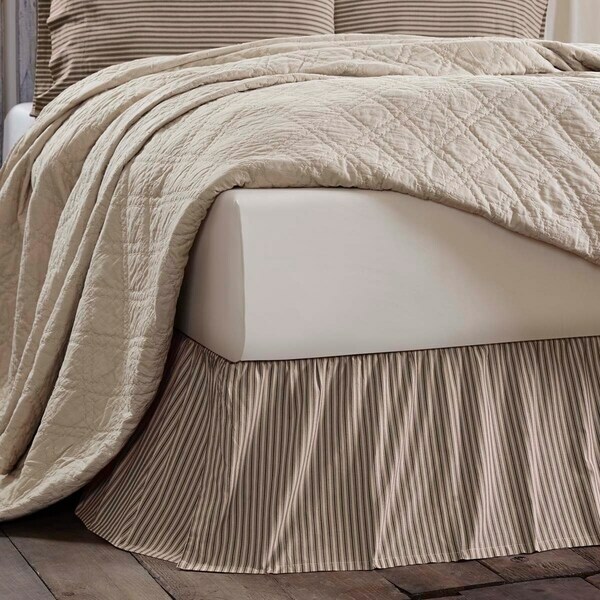 This bed skirt is more of a Primitive or Colonial style. Cute bed skirt. Background color is definitely a tan color rather than cream. Fabric is heavy enough to drape well. Fit is perfect on a queen bed. I bought this for my king bed to complement a quilt. The drape is the perfect length, and the bed skirt was packaged so that no ironing was required. I thought colors of the entire set would be a bit lighter, nevertheless I am very happy with the entire set. I would recommend this product to anyone who likes traditional, country, primitive, or French decor. I bought this for the Evergreen toile cotton quilt set and it works great with it. I love this set so much. Very high quality at a fraction of store prices. Very good quality. Fits perfectly! I like this a lot, but it just doesn't match the quilt I had ordered. So bummed! It was delivered quickly and my return experience was easy as well. I enjoy working with Overstock. Quality looked good but it didn't match the bedding. Beautiful and a great price when compared to other online stores. It's just what I wanted to pull everything together. Love this. Has a farmhouse look of tea stained fabric. Hopefully it goes with the quilt I just ordered! "What color is the green on this bed skirt?"